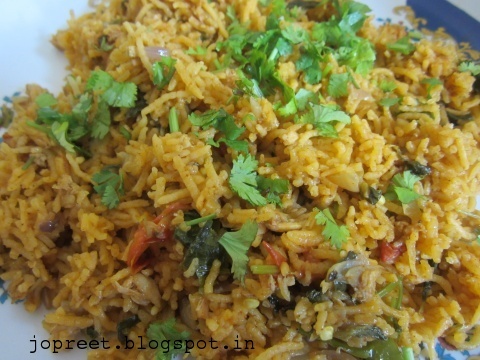 Crab Biriyani / Nandu Biriyani is made with crab meat and not using its claws / legs. This is how i prepare this biriyani. I always preserve the central part of crab to either prepare Crab Biriyani or you can also use it to prepare Nandu Podimas which i shall post later. In my home, Biryani is never complete without Boondi Raita which is a good accompaniment.This Biriyani can be tried by those who feel lazy to chew crab claws and even kids will enjoy this. Boil crab pieces with a pinch of turmeric powder in enough water for 15 mins on low-medium flame. Remove from the heat and allow to cool. Drain the water completely. Remove the shell parts and take out the flesh alone. Clean it nicely. Keep it aside. Heat oil & ghee in a handi or any biryani cooking vessel. Now, add cloves, cinnamon stick and bay leaves. Saute for a while. Add chopped onions and green chilies. Cook for a min on low flame. Add ginger-garlic paste and mint leaves. Mix well and add tomatoes. Cook for 2 mins and mash the pulp. Add crab pieces and mix well. Now, add turmeric powder, red chili powder, garam masala, coriander powder and beaten curd. Cook it covered for 10 mins on low flame. Add 5 cup water and let it boil. Now, add rice, color powder, lemon juice and salt to taste. Mix everything and cook it covered for 10 mins. You can also keep it at dum for 5 mins but it is optional. I always follow this step since this way your rice will not get burnt at bottom and remain as separate grains. Garnish with chopped coriander and serve hot with raita. The crab cooking takes some time so you can cook the crab on the day before cooking and keep it in refrigerator. Use it next day. Heat oil & ghee in a handi or any biryani cooking vessel. Add cloves, cinnamon stick and bay leaves. Saute for a while. Add chopped onions and green chilies. Cook for a min on low flame. Add ginger-garlic paste and mint leaves. Mix well and add tomatoes. Cook for 2 mins and mash the pulp. Add crab pieces and mix well. Add turmeric powder, red chilli powder, garam masala, coriander powder and beaten curd. Cook it covered for 10 mins on low flame. Add 5 cup water and let it boil. Add rice, color powder, lemon juice and salt to taste. Mix everything and cook it covered for 10 mins. You can also keep it at dum for 5 mins but it is optional. I always follow this step since this way your rice will not get burnt at bottom and remain as separate grains. Garnish with chopped coriander and serve hot with raita.